Anyone who desires record-ready Mesa/Boogie tones without spending thousands of pounds would be well advised to take a look. Great sounds. Fantastic value for money. 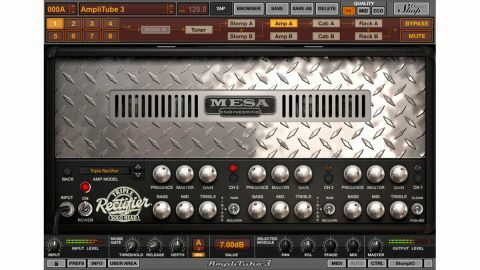 Mesa/Boogie has been synonymous with saturated metal tones since the late 80s. So many recorded riffs, lead runs, pick slides, pinch harmonics et al have been a result of someone spending the cash required to own one of the California co's coveted amps. However, have you ever felt like you needed a glorious metal tone for a fragment of a song? We certainly have… In steps IK Multimedia, with amp and cab models that provide convincing Mesa tones without the expense or the inconvenience. For starters, the Dual and Triple Rectifiers have buckets of clean headroom on their clean channels and give a really satisfying saturated crunch/metal tone on both channel 2 and 3 - if you're used to recording with real channel-switching amps, the iRig BlueBoard MIDI controller gives you extra on-the-fly functionality here. The Transatlantic, meanwhile, is quite a different beast, and suits jazz and blues styles far better - if you're after that jazzy/bluesy/SRV tone, you can most certainly achieve it here. Glassy clean sounds and plenty of very tasteful bluesy dirt are on tap, too, with Santana-esque control of your guitar's volume knob. While the Mark III and IV are similarly featured to the Dual and Triple Rectifiers, they offer a slightly different voicing - being able to switch between Simul-Class and Class A, and change the power amp valves from 6L6s to EL34 is a nice feature, too, and highlights the versatility of this package.